This tour combines our 8 day Tour 4: Imperial Cities of Morocco and 6 day Tour 5: Marrakech Desert Express. The combination of these Morocco tours ‘ itineraries has you visiting all of the imperial cities, Morocco’s premier ancient Roman site of Volubilis, UNESCO world heritage designated Essaouira and the fabulous Morocco Sahara Desert, Kasbah and High Atlas Mountains gorges area. You can choose to enjoy this itinerary for your tour of Morocco by joining one of our deluxe Cultural Experience group tours of Morocco or select it for your own tailor made private tour of Morocco. Begin your tour to Morocco when you arrive at Casablanca Airport and are met by your Berber Treasures driver guide and transferred to your Casablanca hotel. 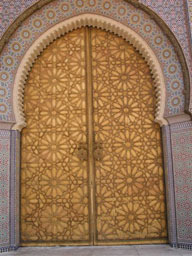 Afternoon city tour to Casablanca’s principal sights including Hassan II Mosque. Overnight in Casablanca hotel. Depart Casablanca for Morocco’s imperial city of Rabat, the capital of the Moroccan Kingdom and a UNESCO world heritage site. 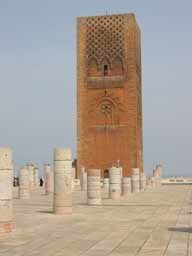 In Rabat tour the city’s sights including Oudaia Kasbah, the Hassan Tower, the Mohammed V Mausoleum, the Royal Palace (Mechouar) and the ancient Necropolis of Chellah, situated in the ruins of the Moroccan Roman town of Sala Collonia. Continue your Morocco travel adventure visiting the UNESCO world heritage 17th century imperial city of Meknes. Tour of Meknes, including the famous massive gate of Bab el Mansour, the main entrance the Alaouite sultan, Mouly Ismails’s 17th century city and the Agdal Basin. Before reaching Fes, travel via Moulay Idriss, Morocco’s holiest town, to the ancient Roman town of Volubilis where you can explore the ancient ruins which include some marvellous mosaics and the remains of many significant buildings including the Basilica and Triumphal Arch. Entering the old Fes medina tonight you can enjoy one of the many beautiful riads in Morocco. Overnight in Fes riad. Full-day heritage tour of Fes city, one of Morocco’s oldest imperial cities with your expert local Fes travel guide. Visit the UNESCO designated world heritage old walled medina, historical monuments (including Madrasa Bou Inania, the Kairaouine Mosque and Mihrab), bazaars and souks (such as the Souk Ain Allou (leather souk), the Souk Attarine (spices), Souk au Henne (henna and kohl)), Fes el Jdid, the exterior of Dar el Makhzen (Royal Palace) including the enormous Merenid gate of Bab Dekakene, formerly the main entrance of the royal palace, the Mellah (old Moroccan Jewish heritage quarter) and the late 16th century Borj Nord fortress (exterior). Return to your Fes riad. Overnight in Fes riad. Continue your trip to Morocco travelling via Ifrane, Azrou, Khenifra and Beni-Mellal south-west to Ouzoud. Passing cedar and pine forests, the route from Ifrane to Azrou crosses Morocco’s Middle Atlas Mountains. As you travel to Ouzoud waterfall, you transit through the Middle Atlas Mountains’ south-western foothill towns of Khenifra and Beni-Mellal. Visit Morocco’s highest waterfall, the 110 metre Cascade d’Ouzoud. Overnight in Ouzoud riad. Travel to Marrakech, Morocco’s imperial city known as the Jewel of the South and a highlight of your Morocco holiday and yet another UNESCO world heritage site. 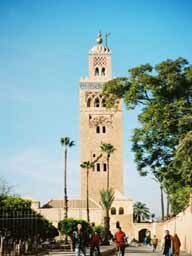 Afternoon half-day Marrakech tour with your expert local Marrakech travel guide. Your heritage tour of Marrakech delves in the city’s stunning past, including the UNESCO world heritage old walled medina, La Bahia Palace, el-Badi Palace, Koutoubia Mosque, the Saadian tombs, Djemaa El-Fna Plaza and Marrakech’s fascinating markets and souks. Escape the bustle of the old medina as you enter the peace of your riad in Marrakech. Overnight in Marrakech riad. Full-day heritage tour to Essaouira. Situated on Atlantic coast this relaxed town with its incredible history, rich cultural roots and fascinating blend of 18th century European and Moroccan architecture. 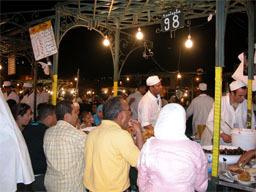 Today Essaouira is popular with domestic and international artists and hosts the famous Gnaoua music festival every June. You have free time to explore Essaouira’s UNESCO world heritage 18th century medina, sample some of the fresh seafood, or relax on the beach. Return to your Marrakech riad. Overnight in Marrakech riad. Free day to explore more of Marrakech, its gardens (eg Majorelle Garden, Aguedal Garden, Menara Garden) and architecture, shop for some bargains in the souks, relax in a traditional Moroccan hammam or enjoy the La Fantasia spectacle . Overnight in Marrakech riad. This morning your Morocco travel adventure into incredible Moroccan desert gets under way as you depart Marrakech and travel into the heart of the soaring High Atlas Mountains, crossing the mountains via the Tizi n’Tichka mountain pass (2260 m). Descending the south-eastern side of the High Atlas Mountains you head to the first desert destination on you Morocco desert holiday, the UNESCO world heritage ksar village of Ait Benhaddou with its amazing earthern kasbahs. Then its on to the nearby desert oasis town of of Ouarzazate, recognised for its strategic importance since the days of the camel caravans and now the movie making capitol of Morocco. Overnight in Ouarzazate kasbah. 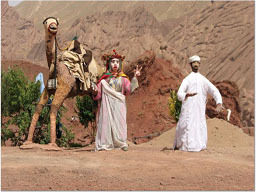 Continuing your exploration of the Morocco desert your Morocco travel adventure takes you to the beautiful Todra Gorge of the High Atlas Mountains before continuing on to the desert Berber village of Merzouga situated on the edge of Morocco’s spectacular Sahara Desert sand dunes, the stunning Erg Chebbi dunes. Here you spend the night at a kasbah peacefully located on the fringes of the Erg Chebbi sand dunes. You have the option to create an unforgettable memory of your Morocco desert holidays – taking a Morocco desert camel trek into the heart of the Erg Chebbi sand dunes to watch the sun set over the magnificent desert landscape and spend the night at a desert oasis in the Erg Chebbi sand dunes where you camp under the stars in a Berber nomad’s tent. Overnight in Erg Chebbi desert desert oasis camp or Merzouga Kasbah. 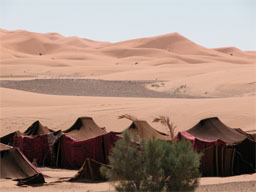 ۞Option to overnight in Erg Chebbi’s Assif n’Itrane Deluxe Camp . You can rise early to watch the sunrise over the Morocco desert sand dunes. After breakfast your Morocco desert holidays travel via the High Atlas Mountains Berber town of Boumalne Dades to stunning Dades Gorge with its Berber Kasbahs, fig orchards and unique rock formations. Overnight in Dades Gorge kasbah. Leaving Dades Gorge your Morocco travel adventure takes you along the Road of a Thousand Kasbahs and through the Roses Valley, which celebrates its rose harvest with an annual May Festival of Roses. Saying farewell to the amazing Morocco desert kasbah area your Morocco desert holidays return to Marrakech. Overnight Marrakech riad.